Sturdy tubular handles. Rubber top mat offers durable, non-skid work surface. Heavy-duty casters have 1,000 lbs. capacity, 2 rigid, 2 swivel, fixed with locking brakes. All welded components bolt together with provided fasteners for easy assembly. Prime cold rolled steel construction. 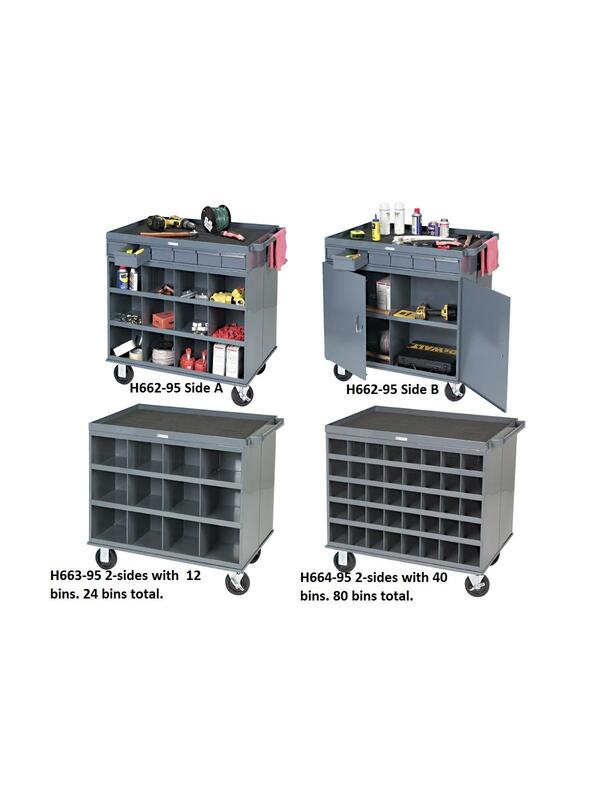 These thoughtfully designed Work Stations bring whatever is needed to the work site. They move easily and smoothly on heavy-duty casters and offer well arranged space to store parts, tools and needed supplies. Easily assembled with provided fasteners. 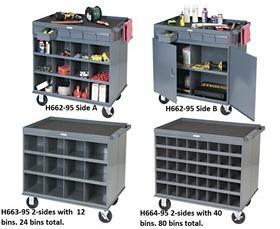 Side B:4 Compartment Lockable Utility Cabinet (10" x 11-7/8" x 6-3/4") with 6 Drawer Cabinet (5-3/8" x 11-1/4" x 2-3/4"). H663-95 - 2-sided with 12 bins on each side. 24 bins total. H664-95- 2 sided with 40 bins on each side. 40 bins total. Check out all Durham Manufacturing Products. Click here to see more Mobile Carts !